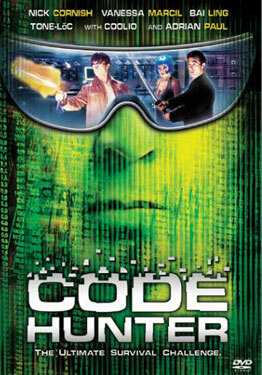 "Code Hunter" is the fictional story of a hacker being blackmailed into stealing technology for an unscrupulous enemy that seeks to control, then wipe out humanity with their insanity. He seeks help from a newscaster, played by Vanessa Marcil (the mother of Megan Fox's stepson) who is reluctant to assist him, due to his story being ambiguous. The film has guest appearances by rappers Coolio and Tone Loc. This film contains unnecessary cursing, which is why it was probably slapped with an R rating, limiting its audience. Though the film was somewhat low budget, it wasn't that bad in how it was filmed, in terms of picture quality and special efx.